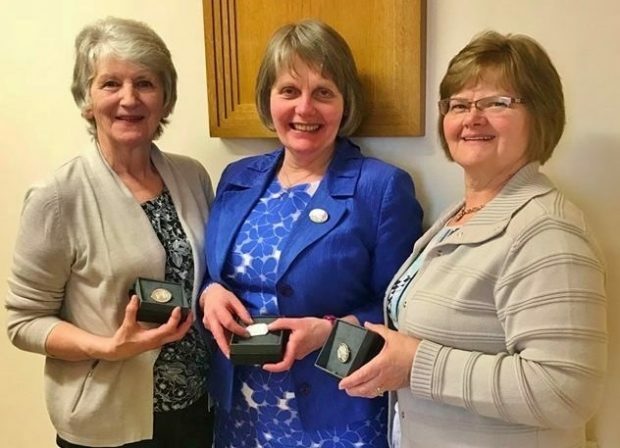 We recently said goodbye to our 2015-2018 Office Bearers – outgoing Federation Chairman Elizabeth Warden (pictured centre), outgoing Federation Vice-Chairman Beth Irwin (pictured right) and outgoing Federation Treasurer Elsie Loughlin (pictured left). The trio were presented with special commemorative brooches in recognition of their time in office. These three ladies were a winning combination, making a great team during their time together in office. We are indebted to them for all their hard work and dedication during the past three years – Thank you! Best wishes for the future – enjoy your ‘retirement’ ladies!